Nothing earth shattering, but the updates to the Electribe's patterns ensure they stay fresh. Minor updates to the Electribe range. New SD card slot for pattern and sample storage. Updated presets and samples. A few missed opportunities in terms of tweaks and updates. Questionable value compared to modern DAWs. The blue EMX is focused on modelling technology, samples are the trade of the red ESX. Nothing too new here, but the Electribes are classic bits of kit. Nearly a decade on from their initial release, Korg has once again refreshed their enduringly popular Electribe range. With the hardware groovebox apparently declining over recent years, it's the perfect opportunity for us to take a fresh look at the popular sequencer and see how they shape up in 2010. What do they have to offer? More importantly, are they still relevant to the producers of today? Given that it's been a while let's start with a quick recap to see what the whole Electribe concept is all about. The story begins in 1999, when Korg released the original Electribe A-1 analogue modelling synthesizer and Electribe R-1 rhythm synthesizer. "Users will enjoy the drive valves can add, but the front panel real estate could have been better employed." Based around a classic step sequencer layout, the EA-1 and ER-1 were an instant hit. Two more models, the ES-1 rhythm production sampler and EM-1 music production station followed in 2000 and 2001 respectively, introducing sampling features and the excellent 'motion sequencer' automation feature. The ES-1 and EM-1 each received major updates three years after their introduction and the EMX-1 and ESX-1 really brought the Electribe concept to its logical conclusion as fully featured all-in-one production environments. Both units offered a single box solution for Dance music production, with drum and synth features, arpeggiator, a good selection of real-time effects and the all-important 'Valve Force' tube gain. 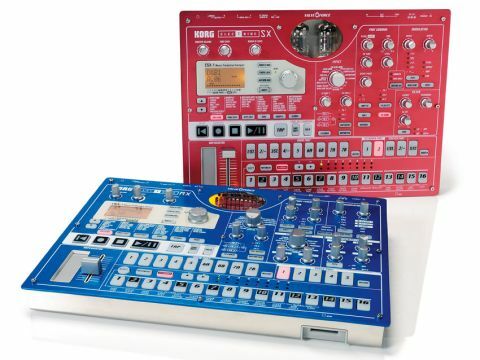 The EMX (blue) focused on Korg's MMT (multiple modelling technology) synthesis approach, whereas the ESX (red) is the sample specialist. New for 2010 are the EMX-1 SD and ESX-1 SD but there's more going on here than just the addition of an SD card slot. Both Electribes are based around their built-in step sequencer, which allows patterns and loops to be strung together to create songs. Patterns can either be played live and recorded into the sequencer for each part (in which case each of your notes is quantised to the closest step) or entered directly in step time using the 16 buttons along the bottom of the unit. The vast majority of sequencing options are intuitive, but the synthesis and sampling features of the two devices take a bit more getting used to. The EMX-1 uses a combination of PCM drum samples and digital wave shapes for sound generation. Basic envelope generator controls and filter options allow the sound to be shaped, but the real power lies in the modulation section in the top-right-hand corner. Here, an oscillator (LFO all the way up to audio rate, with BPM sync option) can be used to modulate parameters such as pitch, filter cutoff or oscillator settings. It's a relatively simple but highly effective system and the range of sounds on offer is phenomenal. The ESX-1's sample manipulation options are fairly similar to the EMX-1's synthesis methods but the sound sources are samples rather than waveforms. Instead of the EMX's nine drum parts and five synth parts, the ESX features nine regular sample parts (primarily intended to be used for drum samples), two keyboard parts for playing back melodies, two stretch parts for tempo-synced time-stretch effects and a slice part which allows you to chop a single sample up into a series of steps. A number of options are available to add interest to your sounds and patterns. Most notably, the arpeggiator found on both units is rather unique, featuring a slider and a ribbon control which combine to offer control of note length and pitch. In use it's surprisingly intuitive, made more powerful by the fact that movements can be recorded directly into patterns for automated playback. This goes hand in hand with the so-called motion sequencing feature, essentially a form of automation which allows you to record knob movements and parameter changes as part of your patterns. The central effects sections on the EMX-1 and ESX-1 are identical, offering a wide variety of options for manipulating your sounds. Effects range from subtle reverb and compression to outrageous bitcrushing and pitchshift. However, it's the master Valve Force tube saturation option that draws the most attention. Essentially a budget tube overdrive unit tacked onto the master output, the signal is run through a pair of 12AX7 valves to add a bit of analogue dirt. We're sure plenty of users will enjoy the grit and drive the valves can add, but we can't help but feel the front panel real estate could be better employed. The LCD screen in particular is a little on the small side and a bigger display could help make things clearer when working with the more advanced features of each unit. The only significant external update for the 2010 models is the move from SmartMedia to an SD card slot for data storage. SmartMedia was always a pretty ropey storage format, the expensive flash cards offering a maximum capacity of just 128MB. Now that it's obsolete, the move to an SD card slot makes total sense. Not only are SD cards cheap and widely available, but the new Electribes can handle cards with up to 32GB capacity. There should be no need to worry about running out of storage space for your patterns or samples. It also makes it a lot easier to transfer data (such as AIFF or WAV samples) from your computer. With such a huge increase in storage space, you'd be forgiven for assuming the ESX-1 SD would offer increased sample time. Unfortunately, you're out of luck - the SX uses its internal RAM for sample storage, so the maximum sampling time remains 285 seconds (in mono). This really seems like a missed opportunity. Those hoping for new features, software updates to fix known glitches or increased processing power will be sorely disappointed. As it turns out, the internal upgrades are limited to the preset patterns, sounds and samples. Korg have enlisted the help of some of the best Electribe programmers in order to create sets of cutting-edge preset patterns that reflect the current trends in every genre from House to Chiptune, Dubstep to Minimal. However, let's be honest: if you're buying an Electribe for the presets you've got the wrong end of the stick. These machines are intended to be used for in-depth programming and composition, not preset noodling. The SD models should really be seen as refreshed versions of the original EMX-1 and ESX-1 rather than huge overhauls. There's no word as to whether the Electribe range will see any major updates in future, but we'd love to see Korg introduce some of the last decade's technological innovations to the Electribe format. Combine the synthesis power of the EMX-1 and the sampling capabilities of the ESX-1, fit a bigger LCD screen, expand the effects selection, throw in a Kaoss Pad-style XY controller and you'd be getting very close to the ultimate groovebox. While we're at it why not offer a USB connection and an editor or even a plug-in-based software controller to run the unit in sync with your DAW? There's so much potential here that it seems a real shame the updates are so minor at this stage in the Electribes' lifespan. When the first Electribes hit the market back in the late '90s, computer music software was only just starting to mature. With computers still expensive and limited by relatively slow CPUs and expensive RAM, hardware groove-boxes were pitched as an alternative to computer-based music making. These days, things are very different - you could buy a basic computer and a couple of nice pieces of software for the price of an Electribe. As such, the Electribe should no longer really be considered an alternative to your computer and DAW. Beginners would almost certainly be better off starting out with a laptop and Ableton Live (above) than either Electribe model. Instead, think of it them as a different workflow. An inspirational tool with unique sound design features and outstanding step sequencer. For that they're great option. The recommended retail price of both Electribe models is £516, but you should already be able to find them available at a street price under £450. It's a reasonable pricing level, if not quite a bargain but if you're an existing Electribe owner, the SD card slot and new presets almost certainly won't be enough to make you want to upgrade. Newcomers to the Electribe will benefit from the increased storage capacity and more contemporary patterns and samples, but whether they'll be enough to attract a new generation of groovebox fans is highly questionable. Still, the Electribes show why they've remained so popular for the last decade. The outstanding step sequencer is the star of the show, making either unit a great choice for creating loop-based music. We'll have to keep waiting for a proper update, but for now this minor revision makes a small improvement to what was already a good pair of products.